XperienceHR Core HR is a new breed of HR solutions. Leaving behind complicated over-engineering, our Core HR is a practical people tool for a modern HR administration. All you need to know about your people is stored in one central place. The XperienceHR Core HR is complemented by our top-notch time tracking and absence management module. 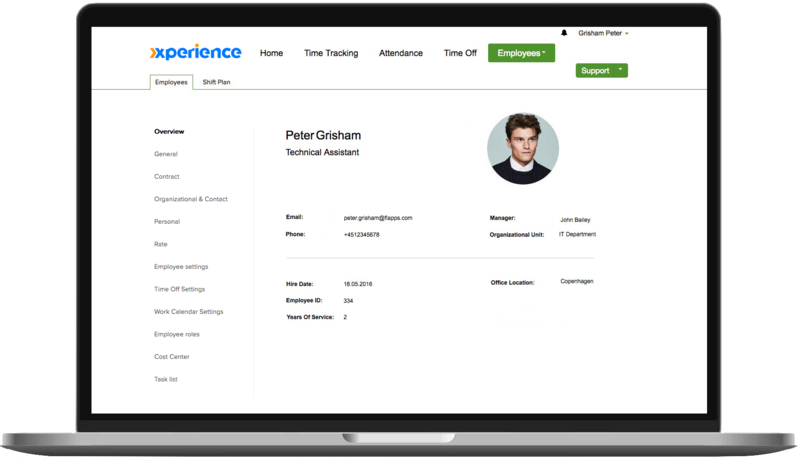 Your attendance and absence data is collected by the XperienceHR app which feeds live data into your employee database. This set up represents all your HR needs to feed monthly data into any payroll system. Employee fields are custom defined to fit your employee data needs. Option to save all employee contracts and documents in the HCM. Our no-coding customizations are very fast and efficient. Core HR module is optional, XperienceHR Time and Attendance can be used integrated with other Core HR database.